Pardes Mein Hai Mera Dil (in English My Heart Lives In A Foreign Land) is a popular Hindi televison soap opera created in India and Europe. It has been broadcast on India’s Star Plus channel since its launch on November 7, 2016. The serial has run daily in 22-minute episodes and is rapidly picking up followers within India and throughout the widely flung Indian diaspora around the globe. The original story line is inspired by the acclaimed Manju Kapur novel, The Immigrant, which examines love through the lens of cultural differences between Western and Indian society. In Pardes Mein Hai Mera Dil, a young Indian woman named Naina lives in Mumbai where she is devoted to her ailing widowed mother. But her devotion causes tension in her relationship with a young man who is relocating to Austria. Eventually, the woman also travels to Austria, where she is destined to meet the love of her life. Her relationships in her new Austrian situation revolve around the powerful Mehra family who have been successfully running an empire of businesses there for decades. The narrative explores what happens to Naina, as well as issues of family loyalty, overcoming obstacles, destiny and the power of love. Many of the serial’s early scenes are shot in Mumbai and it remains a touchstone location, representing home and traditional values for the show’s principle characters. The action begins here with Naina’s family relationships and personal history. Naina follows one love to Austria and discovers another there. 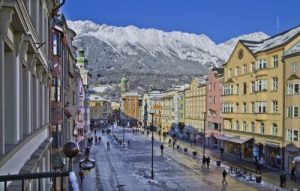 Various locations around Innsbruck are part of Pardes Mein Hai Mera Dil, including the very picturesque and mountainous regions in Tyrol, and Schladming in the North-West part of the country. See INNSBRUCK.info for more Informations and Impressions! 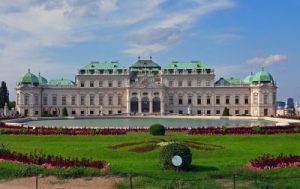 One of Europe’s most beautiful and historical cities, Vienna is a major location for the serial. Lately, the cast has been posting casual shots from the streets of downtown Vienna on social media. It is the home of the prosperous business family the Mehtas, whose paths begin to cross with Naina’s. It is the first pairing of the huge and beloved stars Dhami and Bijlani. Many will tune in just to see these two together. They are both returning to the small screen after absences to feature films and live shows – this is also a huge point of interest. The scenic international locations, especially in Austria, will attract many viewers who have never traveled to this part of the world. The cold temperatures and mountainous vistas, as well as the Old World charm of cities like Vienna should prove to be exotic and irresistable for Hindi-speaking audiences. For a small screen production, this show boasts cinematic values. The producer, director and production team all have vast experience in big screen cinema and the early episodes of the series share those values and aesthetics. This aspect is something a bit out of the ordinary for a television soap series. The story presents a truly contemporary romantic drama that explores real life issues and conflicts involving family and relationships. Again, this show is proposing something a bit different from the usual formulaic plot line of most romantic serials and television shows. The cross cultural nature of story makes this show a modern one, which honestly reflects back the reality of most people in the 21st century. Families move around and re-locate constantly in the contemporary era, crossing boundaries of geography and class in a way and to a degree they have not been able to in the past.